Whenever I’ve washed large pots, cookie sheets or anything that wouldn’t fit in the drying rack, I’ve always laid out dish towels on my counters to use as drying surfaces. I thought that was the only solution. It was a bit of a pain – as it would mean one less dish towel for other uses, and there was always a puddle left behind when all was said and done. 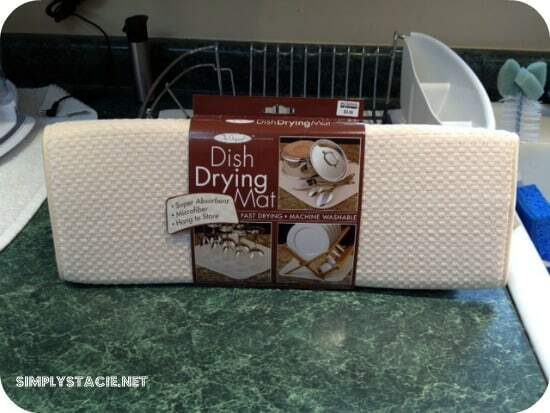 I had seen The Original Dish Drying Mat at Bed Bath & Beyond before, but never thought to give it a try. I recently had the chance to review it and I’m glad I did – it has really made a difference in my kitchen! The Original Dish Drying Mat has a unique, laminated design that combines a thin layer of foam between two layers of super absorbent microfiber which can hold up to 4 times its weight in water. It’s soft enough to cushion delicate items, yet is sturdy enough to hold up to the bigger jobs of heavy pots and cookware. It’s also ideal for placing under larger, heavier appliances to protect counter tops from scratches and scuff marks. The mat is machine washable and folds and stores easily. 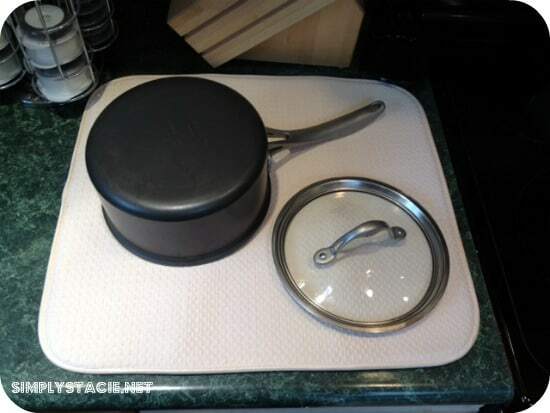 I tried the mat after washing one of my soup pots and was surprised at how little space the mat took up, and how absorbent the material really is. By absorbing in the excess water on the pot, drawing it into the mat and away from the surface, the drying process was much quicker. There was no puddle left behind when I took the pot off to put back on my pot rack. 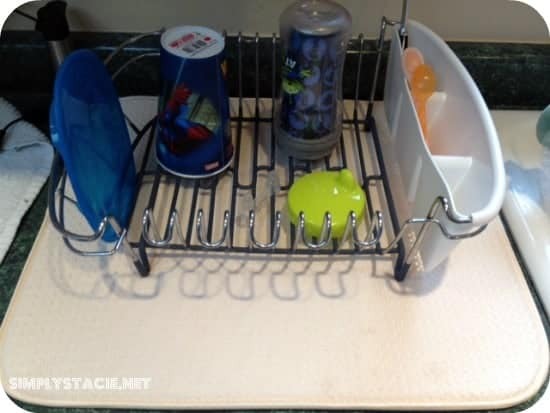 I’m currently using the mat under my dish drying rack, where I would normally have a dish towel that never really seemed to dry and looked very messy. You can learn more about The Original Dish Drying Mat on their website and on Facebook. The Original Dish Drying Mat is sold exclusively at Bed Bath & Beyond. Disclosure: I was not financially compensated for this post. I received a sample of the product from Schroeder & Tremayne, Inc. for review purposes. The opinions are my own, based on my personal experience with the product. I like the Flip It clean mitt. I would also like to try The OriginalTM Microfiber Kitchen Towels. I would LOVE to try the Dish Drying Gloves! These would REALLY cut down on my drying time! I would like the kitchen towels. I like the microfiber cleaning cloths, we have dark furniture and it’s a daily dusting job so these would be PERFECT!! I like the wrinkle release dryer towel and the dish drying mat. I like, Dish Drying Gloves. I love the Dish Drying Gloves! What a neat idea! I like the dish drying gloves. I like the dish drying gloves, such a unique idea. I like the wrinkle release drying towel but I think I would have to go with the dish dring mat currently I use a towel this is much better! I like the The Original Dish Drying Mat XL . I like the micro fiber dish cloths. I would like to try the wrinkle release dryer towel! I think I would love the Microfiber Cleaning Cloths! Flip it clean mitt or the XL drying mat. Thanks! I think the dish dry gloves are kind of neat! Thanks for the giveaway…we like the The Original Microfiber Kitchen Towels. I would love to try the Dish Drying Gloves. The Original Microfiber Kitchen Towels. The Microfiber Kitchen Towel would be great too! I like the Reusable Microfiber Cloths. Very convenient. The Wrinkle Release Dryer Towel looks very nice!